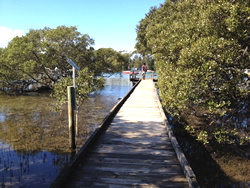 The Mangrove Boardwalk is a 1.4km stroll on a beautifully wheelchair accessible boardwalk through the bio-diverse environment between Currumbene Creek and the Maritime Museum. From the boardwalk visitors can see Grey Mangroves, River Mangroves, bird species, crabs and other flora and fauna. This is a birdwatcher’s paradise. Information notices are displayed strategically to assist visitors identify wildlife. Accessible bathrooms are located in the Jervis Bay Maritime Museum grounds and inside the Museum. This entry was posted	on Saturday, May 7th, 2016 at 9:06 pm	and is filed under shoalhaven-attractions, shoalhaven-entertainment. You can follow any responses to this entry through the RSS 2.0 feed. Both comments and pings are currently closed.